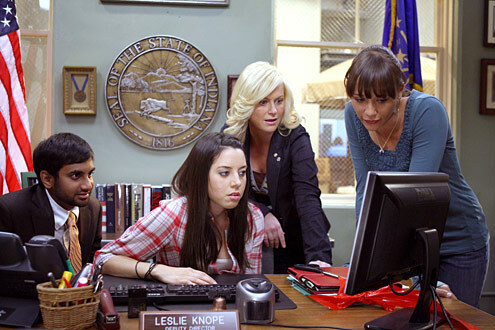 I sort of missed the big hoopla over Parks and Rec when it first came on, because I was never a fan of The Office, and it seemed like just another ripoff of that, only without Steve Carrell to make me consider watching. Well, I'm here to admit that I was wrong. Woefully wrong. 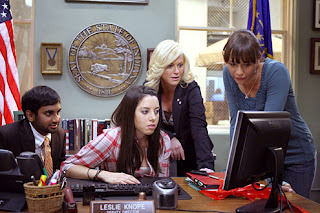 Parks and Rec is unabashedly great, and also pretty damn fun. It's got great likable characters, a fun vibe, and that lovely tendency for blissfully unaware characters to blow their minor problems out of proportion, while still allowing the audience to understand how very small the stakes are. I like it. I also think it's one of the most nuanced, feminist things on television, and that I'm a little shocked I didn't know it until now. The gut instinct is to think it's feminist because the lead character is a woman. And she is. Amy Poehler plays Leslie Knope, a mid-level small-town bureaucrat with absolutely no sense of proportion or the importance of her actions. But that's not the only reason it's feminist. It's more feminist because Leslie Knope is feminist. In a quiet, unassuming way, she strives to be a better woman. 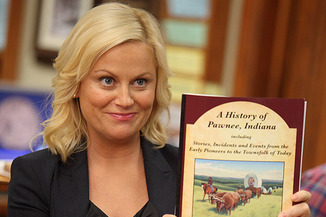 She wants to tear down the walls of power and be the first woman mayor of Pawnee. And no, she's not wildly ambitious (though she thinks she is), and yes, sometimes she's over the top and completely out of touch with reality, but what's awesome about Leslie is that she cares. She's a feminist because she wants to be a damn feminist, so what if she occasionally misses a detail. It's nuanced because it doesn't just stop there. Leslie's not a ball-buster, she gets what she wants by being nice to people. Aggressively nice, in fact. She wants a new park in town, so she pesters people with niceness. She fosters a friendship with Ann (Rashida Jones), the nurse who first brought the potential new park to her attention, and feels that she's mentoring her intern, April, in being a strong and confident woman. The show is as much about the relationships between the people in the office, largely women, as it is about the wacky hijinks of a governmental department. It doesn't hurt that the other characters are also well written and fully formed people. Ann's determination to get some small part of her life fixed, by converting the empty lot to a park, mixed with her inability to say no to people who ask for her time and help, make for a compelling character who is entirely believable. She's a real woman who could really live in your town. So too for April, whose misanthropy and deadpan refusal to do any work make her hilarious to work, but also very interesting when you realize that she's actually incredibly intelligent, if unmotivated. Her relationships with the other characters, and the moments when you see the ice thaw are what elevate her from stock behind the scenes character, to full-fledged person. But really, when it comes down to it, it's all about Leslie. Leslie who wants to make a difference so badly, but sometimes doesn't know how to do it. 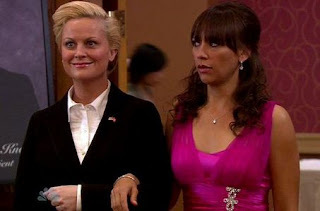 Leslie who accidentally dresses up like a lesbian and brings Ann as her date to a public function, remaining all the while completely oblivious to the opinions of others. Leslie who is not only fully capable of having a deep and meaningful romantic relationship with a man, but just as capable of cutting it off when it looks to interfere with her hopes and dreams. Rock on, Leslie, because you are, in fact, the strong woman you keep telling people you are. And isn't it nice to see a feminist character whose feminism isn't played for laughs? Lots of things about Leslie are hilarious. Her inability to fully interface with reality is really just the tip of the iceberg. But her actual feminism, and her insistence on being taken seriously, those are just part of who she is, and are counted as no more remarkable or laugh-worthy than her boss Ron's belief in small-government. Leslie is a feminist. Good for her. Much better to mock her for how very much she loves waffles. 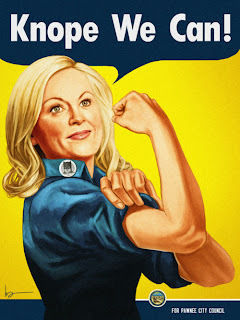 So here's to you, Leslie Knope. Thank you for constantly trying, for persisting in your dream of one day running Pawnee, and for giving us hope that someday we can have more fully-realized, realistically portrayed, and genuinely nice feminists on our television screens. Good luck with that. And the Men Who Support Them.